CLICK ON OLD NEWS TO SEE NEWS STORIES BEFORE 2017. Met on Thursday, March 14, at 6 pm at the Oracle Fire Station. You can also call OFD at 896-2980 or visit their Facebook page: Oracle Equine Evac. call 520-866-3645 or email: hohp4heroes@gmail.com. Latest Snow and Ice Accumulation Can Create Problems for Your Home! – Pinal County has release information that may help you deal with the dangers of snow and ice to your home. Click HERE to read these helpful DOs and DON'Ts for home owners. WINTER SNOW IN ARIZONA – ADOT has winter-driving tips available at azdot.gov/KnowSnow. Download the free ADOT Alert App to your mobile for more up-to-date information on travel. PRESCRIBED BURN – Oracle AZ (February 27, 2019) – Smoke has been seen recently from Oracle in the direction of the Galiuro Mountains. The Safford Ranger District of the Coronado National Forest is conducting the Fourmile Prescribed Fire. The project area consists of National Forest System lands in the northwest portion of the Galiuro Mountains in southeastern Arizona, and is included in the Forest’s Galiuro FireScape Project. Click HERE to read all the details of this burn. SAVE THE DATE! (2019) – Oracle Firewise Board is preparing for a Town Hall in Oracle on Tuesday, Feb. 26, 2019 on "Wildfire and Insurance: What You Need to Know." It will take place at the Oracle Community Center from 6:30-8:30pm. Click HERE to view the information flyer and agenda for the evening. VIPER ELVES – Thanks to a recent visit from the "Viper Elves" crew, the old historic vehicle, the Viper, was decorated for the holidays and lit up at night. Thanks to Karen Lombardi, Mary & David Harris, Kevin Armbrust and Virginia Gonzales for decorating as well as Dale Suter and OFD firefighters for getting it ready. ORACLE HYDRANT CLEANUP – the Oracle CERTs met on Saturday, Sept. 15 at 7am to participate in the annual Cert Hydrant Cleanup. Tina started their day with coffee and muffins and they proceeded to weedwack and clear debris from all the hydrants in Oracle so firefighters have one less problem when they need to get access. With the grasses being at an all-time high, it was quite a job. We would like to thank Dale Suter and his crew: David and Mary Harris, Barb and Bernie Haas, Susie and Collins Cothran and Holt Bodinson. New Oracle Fire District Board member Will Ramsay – Will Ramsay, was sworn in at the OFD meeting on July 18, 2018. Former Oracle Fire District Operations Chief Will Ramsay was selected as the new board member replacing Dale Suter. Will had 32 years of service with the Oracle Fire District before retiring in 2014. With his experience and friendly personality, he will be a great addition to the Board. He is shown here being sworn in by Fire Board Chairman Franky Hill as the newest member of the Oracle Fire District Board. CYPRESS FIRE IN ORACLE (07-16-18) – A huge storm rolled in last evening and brought lots of wind, hail, and rain (0.41" at OFD and over 1" in some areas). Washes were running. It also brought a bolt of lightning that caught a cypress tree on fire in mid Oracle. 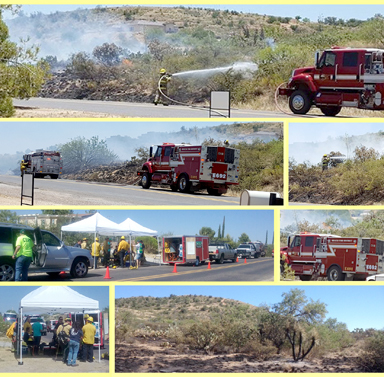 BRUSH DUMP NEWS – April 18, 2018 – Oracle Fire District was able to burn the huge amounts of weeds, grass and brush that have accumulated at the Brush Dump located on American Ave. near the entrance to Oracle. It is now open for your use. H.O.P.E. 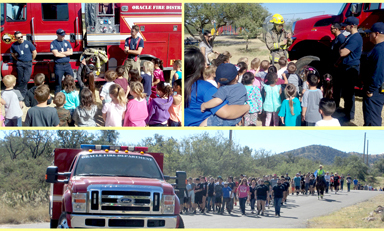 (Health Outreach Prevention Education) Walk – Fire Prevention Week (Oct. 9-13): This week was a busy week for both OFD personnel and the support groups Firewise and CERTs. 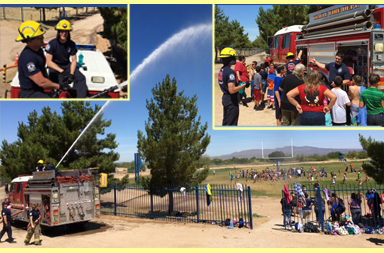 Volunteers were needed to teach or assist teaching Oracle students about Fire Safety, Firewise, and Fire Prevention. Firefighters on duty brought fire trucks to the school to acquaint the children with both firefighters and their equipment. Firewise and CERT volunteers also assisted in traffic control on Friday, Oct 13th during the actual HOPE four-mile walk where children go through the streets of Oracle. VACANT SEAT ON ORACLE FIRE BOARD – Oracle Fire District is currently seeking a person to fill a vacant seat on the Oracle Fire Board. The remainder of the four-year term will expire on Nov. 30, 2020. Click on the Letter of Interest for more information and to apply by 5pm on Dec. 27, 2018. SANTA IS COMING! – Santa will be flying in on the medical helicopter and landing on the school football field to wave to the kids at Mtn. Vista School on Friday, Dec. 14, 2018 at mid-afternoon. He then climbs into the fire truck to ride around Oracle to let everyone know he'll be at the Oracle fire station for about two hours from 5-7pm. There will be stockings filled with goodies for each child, cookies, hot chocolate, Santa letter-writing and drawing, and a jumping castle. Here's some photos from last year. Merry Christmas to y'all! To sign up for future meeting dates and more information, please email: horses.are.purlove@gmail.com or inquire at Oracle Fire Station at 896-2980. ORACLE TOWN HALL – We had our Oracle Firewise Town Hall Meeting on Thursday, March 22nd, at 6pm at Oracle Community Center. Wildfire season is just around the corner and we learned about what you can do to better protect your house and family, and how to prepare for possible evacuation. Representatives from the Arizona Department of Forestry and Fire Management, Pinal County Emergency Management, Pinal County Sheriff’s Office, Department of Public Safety and The Red Cross participated in the meeting. Additionally, a couple of new groups were at the meeting to talk about what they are doing in our community: the Oracle Horse Evacuation preparation group and the Oracle “Village People,” for neighbors helping neighbors. 2017 PROPERTY AWARDS OF THE YEAR – (Sept 12, 2017). The Oracle Firewise Board presented the 2017 property awards of the year to residents of Oracle. Mary Harris and Becky Taylor, co-chairs of the Board, presented the residential award to two different locations this time, Rodolfo & Margaret Moreno and Andrew & Allison Hendrix. The commercial award went to Living Word Chapel. Lead Pastor James Ruiz accepted the award for the church. Shown above are co-chairs Becky Taylor and Mary Harris, Fire Chief Jennings, Pastor James Ruiz, the Moreno and the Hendrix families with their certificates. Oracle Fire District Fire Chief Robert Jennings was at the presentation and spoke to the audience about the importance of being firewise and clearing property of brush, grass and other potential fire fuels. He said that it has helped in recent fires in the area and has prevented fires from spreading. He also commended the Firewise Board and group for the work they do. 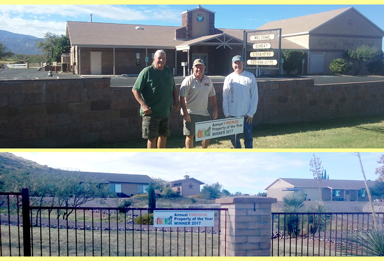 Thanks to the efforts of Dale, Brian and Kevin the new property award signs are now in front of each of the properties. Arizona Dept. of Veteran Services will be at Oracle Fire District on Wed., June 27 from 10am-2pm. Get information on Ebenefits and MyHealthVet websites, referrals to emergency services and help with questions on veteran services. For more information, call 520-866-3645 or email: hohp4heroes@gmail.com. 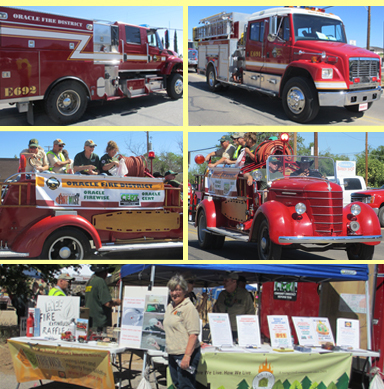 HOPE YOU ENJOYED THE OAKS FESTIVAL ON APRIL 22, 2018 – Click HERE to see a video of OFD in last year's Oaks Parade by Laura Flores. Here's a photo of the Oaks Parade. CPR CHALLENGE – AMR, as part of a nationwide event is presenting free CPR training to the public. It will be held in Oracle on Tuesday, May 22, 2018 from 10:00am-1:30pm at Oracle Fire Station at 1475 W. American Ave. You can just drop in as you wish. Click HERE for more information. American Medical Response (AMR) is presenting this in observance of National Emergency Medical Services Week. NEW FIRE FIGHTER – We welcome John Savage as our newest Full Time Fire Fighter. Fire Fighter Savage has reserved with Oracle for the last two years and was awarded a full time position this March 2018. John also served in the U.S. Marines for five years. We thank Fire Fighter Savage for his commitment to our community and country. Horse Evacuation Preparation Meeting – on Tuesday, March 6, 2018 at Oracle Fire Station, Oracle residents and horse owners discussed how to prepare for animal evacuations during an emergency, such as a wildfire. Inquire at the fire station if you are interested in joining this group for future discussions. The next meeting is April 12. PUBLIC MEETING ON OVERDOSE PREVENTION AND NALOXINE TRAINING. There will be a meeting on Wednesday, March 28, 2018 at 6:00 PM at Oracle Fire Dept. Click HERE for more information if you wish to attend. March 28 from 10am-2pm. Due to construction in our parking area, they will be parked next door at 1395 W. American Ave. For more information call 520-431-5663. FIREWISE ASSESSOR COURSE – This 2-day course is designed for fire professionals and community members interested in evaluating properties from a Firewise perspective. The course will train individuals in fire ecology, fire behavior, property assessment, and fire hazard mitigation tactics for property owners. Those interested should contact Oracle fire station for more information. It will be held in Kearny on January 20 and 21, Saturday and Sunday. PLEASE CLICK HERE TO SEE A PDF WITH INFORMATION ON THIS COURSE. FIREFIGHTER OF THE YEAR – Nick Brening was recognized as the 2017 Firefighter of the Year at a presentation dinner at the Elks in San Manuel on Saturday, January 20, 2018. Nick has been with Oracle Fire District for approximately two years. During that time Nick was able to fill in as shift lead during the absence of our captains or engineers. His commitment and very positive attitude are greatly appreciated by the district and surrounding communities. We congratulate Nick on his achievement. We look forward to his continued service. Shown here is Oracle Fire Chief Robert Jennings with Nick accepting his award. Photo by Jennifer Carnes. Here is a photo of Nick Brening with the Fire Chief, officers and some of our firefighters at the dinner. Brush Dump Revamp . . . (January 2018) Recently, the Oracle Firewise group started preparing for a revamp of the Brush Dump near the entrance to Oracle to facilitate a better way for folks to get rid of their limbs, leaves and firewise hazards off their property and to facilitate the area better for burning and clearing. Shown here is the group preparing buckets to designate areas for dumping. 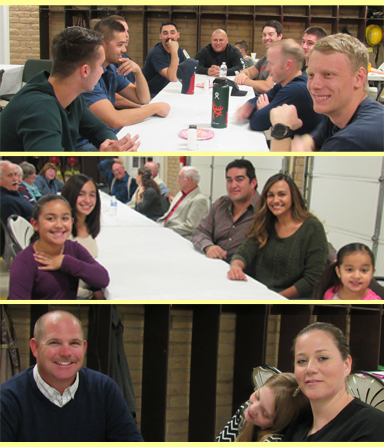 OFD CHRISTMAS DINNER – A nice time was had by all with a scruptious meal prepared by the OFD staff and volunteers for this year's Christmas dinner on Friday, December 15, 2017. Here's wishing to you and yours – a safe and merry holiday to you all! SANTA MADE IT TO ORACLE! 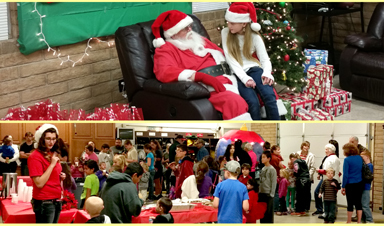 Santa landed via helicopter at Mtn Vista School on Friday, Dec 8th. He was at the Oracle Fire Station from 5-7pm to greet the kids. While they were waiting to visit with Santa, they romped around in a jumping castle, wrote Christmas letters to Santa and mailed them from the station. They also had fun coloring Christmas pages, and enjoying cookies and hot chocolate. Captain Paul Farrell . . . was recognized at the most recent Oracle Fire District Fire Board meeting (11/2017) for obtaining the level of Engine Boss. This is prestigious certification that takes many years of hard work both in the classroom as well as on wildfire assignments. A“task book” is started very early in one’s career, and, little by little, significant accomplishments are achieved, signed off, and intermediate levels are assigned until finally, every objective in the task book is completed. At that point, the book goes in front of a “Red Card Committee” at the Arizona State Forester’s Office. It is this committee which determines whether the designation of Engine Boss should be awarded. Captain Farrell received this official title this month. As an Engine Boss, Captain Farrell can lead a wildland fire engine out on assignments, either here in the Oracle Fire District, throughout Arizona or elsewhere in the United States. Thank you Captain Farrell for your hard work and dedication to your profession and to Oracle Fire District! And, special thanks to Martha, David, and Patrick Farrell for the huge sacrifice of your husband and father during these lengthy and dangerous assignments. Firefigter David Selby . . . Welcome Firefighter David Selby to the full-time rank at Oracle Fire District. Firefighter Selby was hired as a “Reserve Firefighter” in 2015, and after passing a lengthy testing and interviewing period, was hired full-time this July. Thank you Firefighter Selby, for your hard work and dedication to the community of Oracle, the State of Arizona, and the United States of America. NEW OFD BUILDING – Wondering what is happening at OFD with the new building? When complete, this building will be utilized for some storage that replaces the old building on Mt. Lemmon Highway that was sold last year. 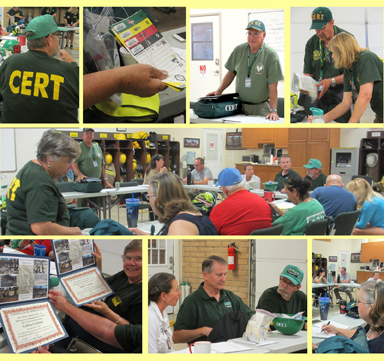 CERT DRILL – Tuesday, Aug. 8, 2017 – Oracle CERTs (Community Emergency ResponseTeam) held their monthly meeting and drill led by co-chair Doug Johnson. Their task was to review and check their CERT bag items. CERTs keep these bags handy in case they are called in an emergency so they are ready quickly. There were also Certificates of Appreciation presented by the Pinal County Office of Emergency Management to those certs that volunteered at recent fires or events. They included Susie Fairbanks, Kevin Armbrust, Susie & Collins Cochran, Barbara & Bernie Haas, Doug Johnson, David Harris and Dale Suter. We thank you for your service. BRUSH DUMP NEWS – Saturday, September 2, 2017 – Oracle Fire District was finally able to burn the huge amounts of weeds, grass and brush that had accumulated at the Brush Dump located on American Ave. near the entrance to Oracle. Did you know that we have had 1671 trips to the brush dump so far this year? The grasses etc. are at an all time high after all our rains. However, to actually do a 'burn,' all sorts of parameters must be in place before OFD can do this. So this burn was most welcome at this time. It will still take more time and work to get our community safe again. We are happy we can get "back to business" and continue this effort. Thank you Oracle! Keep 'er comin'! ARTICLE – This time the NY Times has an article called: "Let Forest Fires Burn? What the Black-Backed Woodpecker Knows." A scientific debate is intensitying over whethere too much money and too many lives are lost fighting forest fires. Click HERE if you wish to read this. ARTICLE – Want to know more about the science of wildfires? UA News has an article "AN INSIDER'S PERSPECTIVE ON THE SCIENCE BEHIND WILDFIRES." Click HERE to read this insight about the ecology and physics involved. SMELL SMOKE? if you see or smell smoke or see a fire, please call 911. If you would simply like to know more about the fires burning in Arizona, please follow this link to Inciweb: http://inciweb.nwcg.gov/. EMERGENCY EVACUATION LIST – If you would like to have a suggested EMERGENCY EVACUATION LIST click HERE to see and print the pdf to have handy. ORACLE BRUSH FIRE – A brush fire was reported on Calle Futura in Oracle about 11:30am on Thursday, June 29th. OFD crews responded and were able to stop the spread at approximately 1.75 acres. Two fire departments responded besides OFD which included San Manuel and Golder Ranch. OFD Certs assisted with hydration and heat relief. Thanks for a great job stopping the fire and containing it to a few acres and the support. This is an important reminder of how dry it is and how dangerous any type of spark can be! Please be extremely careful with any form of sparkler or fireworks over the July 4th weekend. ARCING WIRES – There was a small fire in the heart of Oracle on June 19th, caused by arcing wires, which burned the top of a tall pine tree. A crew from the Bureau of Indian Affairs San Carlos Irrigation Project responded to repair the line and to clear the brush from under the power line. They told our crew that this is a free service that they provide for brush removal directly under their power lines. If you have this situation or know of an area of concern, you can call the BIA at 520-723-6209, option #1 "to report a utility hazard." What is a Red Flag Warning? – According to the National Weather Service, a Red Flag Warning is issued when a "combination of low humidity, strong winds, dry ground cover, and warm temperatures are expected to bring critical fire weather conditions to the warned area." When we have these conditions, you may see a red flag flying in front of the fire station. Please be vigilant and cautious especially on these days. The fire status in Oracle is now at Very High. OAKS PARADE 2017 – A good time was had by all at the annual Oaks Festival on April 22, 2017. Oracle Fire District got to show off some of their apparatus and the CERT and Firewise group joined in on the Viper. In addition to the Viper and information booths, they also brought the Kid's Safety Van which featured firewise experience and tips for kids. This was a hard-wired smoke alarm that could have caused a fire in the home. Check with OFD to see if you can take part in the free smoke alarm/ CO2 program. CALIFORNIA FIRES – Hundreds of firefighters are trying to contain blazes across Northern California that started on Sunday night (9/8/17) in what officials said was one of the more destructive fire emergencies in the state's history. For more information check with your news source or click HERE to go to the inciweb website that is specific to each fire in each state. 9/11– A DAY OF REMEMBRANCE – for those that lost their lives, and for all those who gave their lives. We remember. Fire Restrictions in CORONADO NATIONAL FOREST – Stage II is now in effect. Click HERE for a list of what is prohibited and what is acceptable. 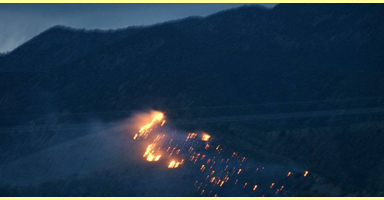 ROACH FIRE – A fire started on July 7th in Dudleyville along with evacuations. OFD assisted along with other support resources. The CERT trailer was also used as a rehab center over the weekend to help personnel. All road closures and evacuations were lifted on Sunday, July 9. As of Monday, the fire is estimated at 335 acres with containment lines established around 95% according to the Arizona Department of Forestry and Fire Management. The cause is under investigation. Click HERE for information. BURRO FIRE – There is a fire near Redington Pass called the Burro Fire. Details are on Inciweb. If you see or smell smoke from that direction, It could be this fire. CERT MEETING IN PINAL COUNTY – Recently, our Oracle CERT team (Community Emergency Response Team) of Doug Johnson and David Harris met in Florence with the Maricopa CERT team and the Pinal County OEM to discuss local issues. NEW ASSISTANT FIRE CHIEF – former Battalion Chief Brian McGinnis received his Assistant Fire Chief badge during the Oracle Fire Board meeting on April 5, 2017. Brian McGinnis is shown below being pinned by his wife Crystal. Fire Chief Robert Jennings was honored to present Brian with his new badge and to welcome him to his new position shown below that. WELCOME NEW FIRE CHIEF – Robert Jennings was officially sworn in as our new Oracle Fire Chief on January 11, 2017 at the Oracle Fire Board meeting. 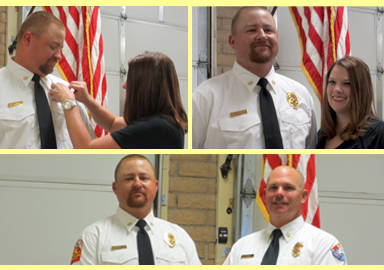 Shown here is Bill McMurry with Robert, and also Robert with his wife Andrea "pinning him" with the Fire Chief badge. We wish Robert all the best of luck in his new position. LARRY SOUTHARD RETIRES! – A retirement party at OFD on January 14, 2017 was quite the gathering of friends and colleagues of Chief Larry Southard. Click on the photo below for some more photos at the event. We wish Larry and Terrie all the best of luck in their new adventures. SAWMILL FIRE IN GREEN VALLEY – Oracle Fire District sent a brush truck to the Sawmill Fire on Monday, April 24th with three of our firefighters. Update: Our crew got back on Saturday, April 29th. As of April 30: The Sawmill Fire was burning on lands under the jurisdiction of Arizona Department of Forestry and Fire Management, Bureau of Land Management, and the Coronado National Forest. Gusty winds and broken topography have contributed to growth of the fire, burning in tall grass, riparian woodland, mesquite/oak brush, oak woodland, and pinyon-juniper fuel types. Values at risk included homes, ranches and outbuildings, communications facilities, powerlines, and the Arizona National Scenic Trail. BRUSH THINNING GRANT – OFD is pleased to announce the award of new brush thinning grant funds. If you have not yet signed up for a property assessment to determine if your property qualifies for brush reduction work, please either call the Station at 896-2980 or stop by to provide your name, phone number and physical address. A representative will call you to set up an appointment sometime in April. 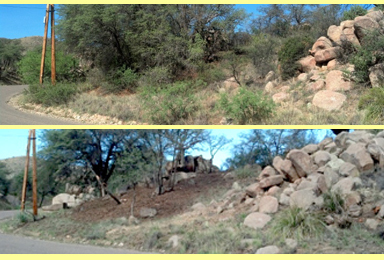 Shown below is an example of before and after that was done recently in Oracle. EAGLE ONE MOBILE OUTREACH AT OFD – Counselors from Arizona Dept. of Veteran Services will be at Oracle Fire on March 30th from 10am-2pm and again on June 28, Sept. 27 and Dec. 27, 2017. For more information call 520-866-3645 or go to: hohp4heroes.org. Pinal County SPAY/ NEUTER FREE CLINIC FOR DOGS AND CATS AT OFD – Saturday, April 1, 2017 at OFD. Shots and exams are available for pets being altered at that time only. Appointment time is given when paper work is returned. For more information, text only to 520-705-5435 or email: Cherhe70@yahoo.com. NEW FIRE CHIEF STARTING 2017 – We are pleased to announce that as of January 2017, Robert Jennings (seen right in photo below) is our new Fire Chief. Congratulations to Robert on this important position for the fire district and the community of Oracle. Manny Navarro has stepped down from the Oracle Fire Board as his term ended. He was given a plaque at the Oracle Fire Board meeting on Nov. 8, 2016. We would like to thank Manny for his service to the fire district and to the community. MARK YOUR CALENDARS! – An informal celebration for Fire Chief Larry Southard's service to the fire district and the community of Oracle will take place at the fire station on Sat., January 14, 2017 at 2pm. Please stop by to wish Larry your best.